The one thing I can tell you is that The Rheem Water Heater Company is very good at customer service and providing honest warranty protection. A copy of the actual invoice may not be necessary because the label will tell the date of manufacture of the unit. If the unit is installed much later than the label manufacture indicated, Rheem will generally give a 90 day grace period from manufacture of the unit to the date of actual installation. WE are a small company so of course we buy in small quantities you get the freshest water heaters possible, usually installed in about two months from manufacture. Most service calls I get are for other brands of water heaters. Rheem heaters seemed to have kept the same electronics for the past 40 years and their motto might as well be ..'if it ain't broke.."
The occasional bad thermostat often is due to a direct lightning strike or a poor installation. By the way, Look at this picture. This is often the result of a poor installation. That's a FIRE you see there!! That one was NOT installed by us!!! Sometimes when Rheem heaters are not available for installation and the customer insists that I install their inferior brand, I know I will probably get a service call out of that heater in about 2 years. The majority of warranty claims are most likely due to very poor installation procedures by unlicensed and/or just plain stupid installers. I have been to many fire damaged heaters and water damaged homes to see that the installation by someones, friends - brother on the stepfathers side, just did not know about such things as electrolysis and dis-similar metals. Or that stress in a line may lead to a burst. Or what constitutes a very poor 220 volt wiring connection. Some things in life (such as life) are too important. If you had a friend put in a unit for you, at least give me a call and let me take a look at the job and give you a free look at the installation. I may see something glaring that needs to be changed. Then maybe you can yell at someones, friends - brother on the stepfathers side. All units are the industry standard, SIX YEAR warranty except the heat pump and tank less systems that have longer warranties. 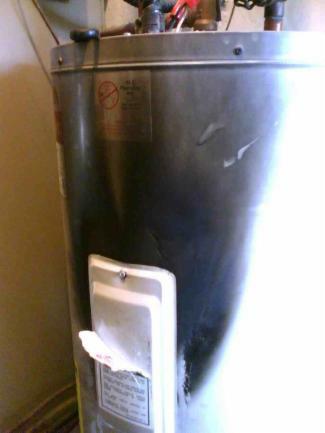 in my experience, Rheem Water Heaters WILL VERY SELDOM FAIL before 10 years and the cost of an additional length warranty may not worth the small probability of failure. but be sure to get a heater with a protective ANODE ROD in the tank.